The moment of truth came when we first clipped in to our Fezzari Timp Peak. As we outlined in our First Look, Fezzari’s internet-based, direct-to-consumer model allows the Average Joe Rider to play product manager, selecting sizing, parts and spec. Sounds great in theory, but what if we screwed up? What if we built a Frankenbike? It turns out our fears were unfounded. Not only would Fezzari’s excellent customer support staff help make sure the build was up to snuff, but the Timp Peak’s inherently excellent chassis, and a dialed parts mix collaborated to create a truly pleasant surprise rides in our Compare-O. 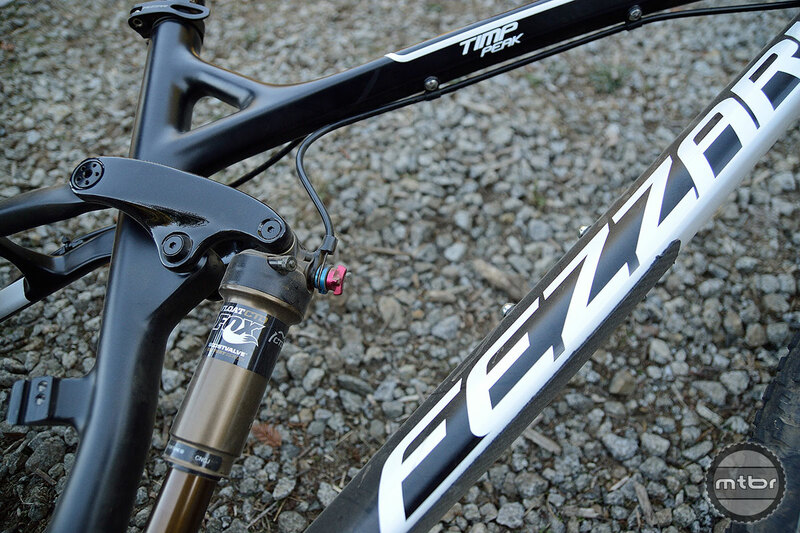 From that first pedal stroke we had a feeling the Timp Peak was a winner, and the fact we literally had to pry it away from our last test rider, speaks volumes about the goods the Fezzari delivers. The Timp Peak’s frame is an all-carbon affair—front and rear triangle, as well as the suspension linkage—which equates to an extremely light ensemble with excellent lateral rigidity. With 150mm of front and rear travel the Timp Peak is right in the sweet spot of our Compare-O bike selection, as are its 67 degree head tube angle, and 13-inch bottom bracket height—spot-on for a 27.5-inch wheel bike. Accordingly the Timp Peak descends with confidence. It loves to carve singletrack and is easy to throw around in technical turns, as well as the air. And while the bike is indeed quite lively when you push it, it comes at the expense of small bump sensitivity and suppleness. True-to-form, the Fezzari admirably managed the hits—and mis-hits—on three-to-four-foot drops and a few cased doubles. Again, we didn’t get that soft soak-up, but we didn’t feel even near the edge of disaster either. That lack of plushness may actually be a plus when the trail turns skyward and the Timp Peak shows some XC-like personality. As looks go, the Timp Peak goes for a low-key, flat black approach. It doesn’t have great lines or graphics but it’s not unattractive either. Our crew generally liked the functional look that seems more purposeful than artistic. 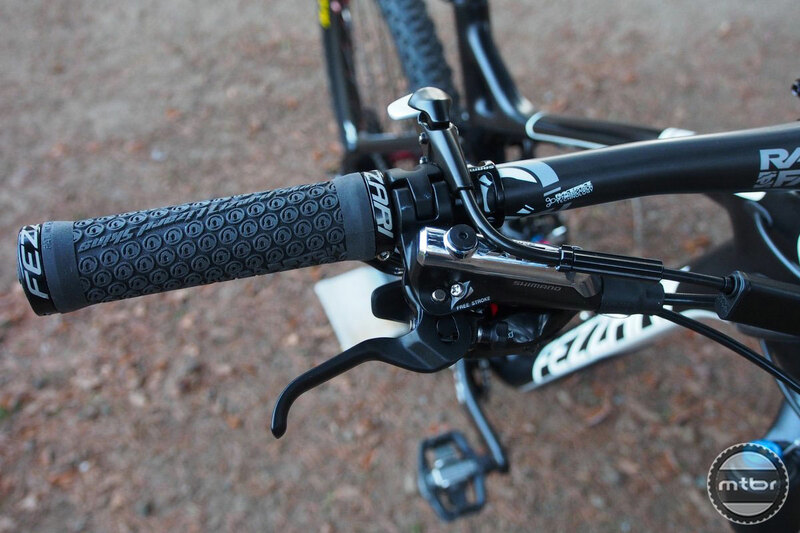 The Timp Peak came with a handlebar remote to simultaneously control the Fox three-mode, Climb-Trail-Descend—or CTD—front and rear suspension. Like with other bikes in our test—the Scott Genius 720 and the Rocky Mountain Altitude—we fought through our aesthetic displeasure at the tangle of cables near the head tube, and started to “get” how such a setup can improve the ride. Like a dropper post remote, the ability to change your suspension on-the-fly becomes both more intuitive and more useful the more you take advantage of it. With standard suspension controls we find ourselves leaving the shock and fork in less-than-ideal modes because we can’t—or don’t feel like—reaching down and fiddling with knobs and levers. Conversely, having a convenient lever at the fingertips, encourages more frequent and appropriate use of the Climb, Trail and Descend modes. And one thing we’ve learned about remote systems is they allow you to set the suspension softer since it’s so convenient to switch it to Trail or Climb mode. Some of our riders would rather live without than to have yet another handlebar control and the cabling that goes with it. But after riding with such systems for a while, they became more understanding. Crazy that we call a $6400 bike a “great value” bike lol. (and I’m not arguing it isn’t). >>Crazy that we call a $6400 bike a “great value” bike lol. (and I’m not arguing it isn’t). Guys, I check your site every day to see these reviews. However, with each review, I’m becoming less interested. Here’s why. I want to see HOW THE BIKE RIDES! This review is pretty useless. Please, consider maybe a 5 or 10 star system. Rate things like small bump, big drop, stiffness, climbing, descending, cornering, nimble-ness, etc. Without some common ground, much of this is less interesting. If you really want to provide a HUGE service to your readers, consider making a master table. List the categories, travel front, rear, price, frame makeup, wheel makeup, and then add the ‘score’ below. At a glance, your readers can look and see what they gain and what they give up for each model. If a person loves up and down, you need one that is competent in both. Something more comparative would be nice, as Peter E said. You’ve got all these riders and bikes in one spot, why not give a lap time average on these bikes? Which is fastest up or down? 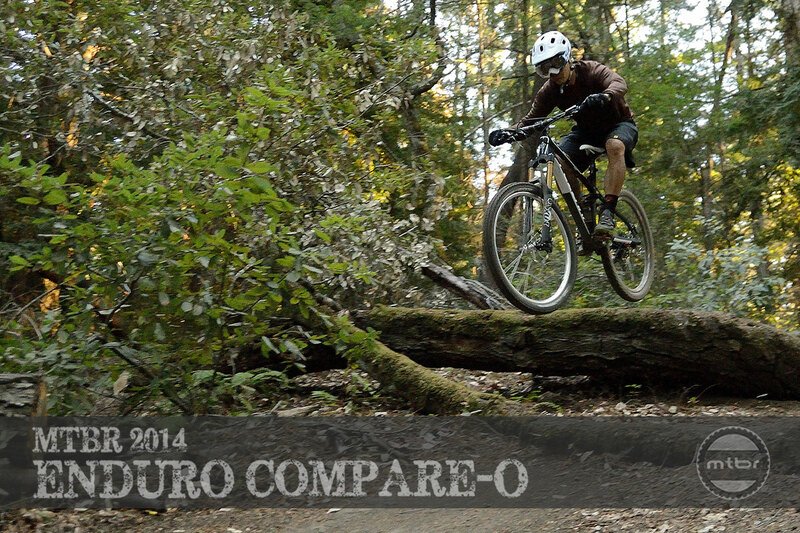 You call this a Compare-O, but it’s far more serial reviews than comparing the bikes. >>Please, consider maybe a 5 or 10 star system. Rate things like small bump, big drop, stiffness, climbing, descending, cornering, nimble-ness, etc. Without some common ground, much of this is less interesting. Point taken. What we’ll have in a couple of weeks is awards in about 5 categories. Best climbing bike, Best descending, Versatile, etc. Winners and runners up. No details of the pivot hardware,bearings or links on this basically unknown brand? We all know that the quality of these items can make or break any FS frame.